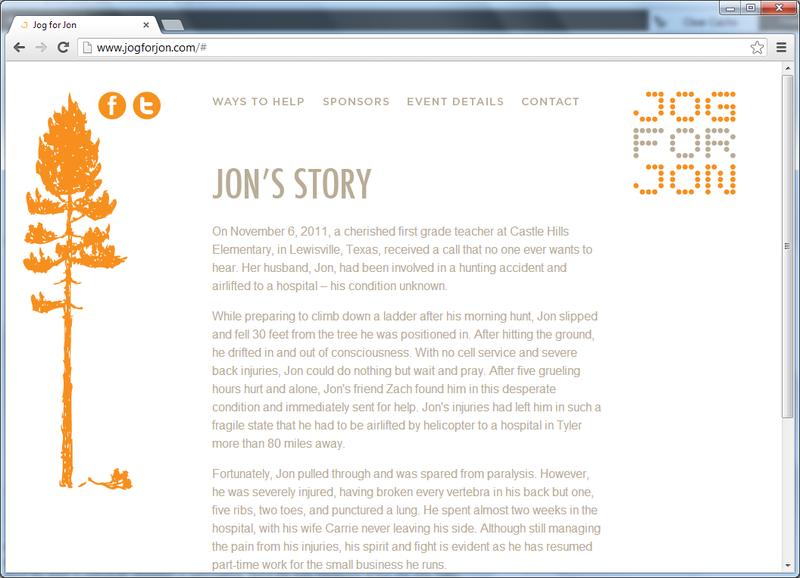 We just put the finishing touches on a quick site we developed for a charity fun-run; the site is available online at www.jogforjon.com. The goal of the site was to quickly and efficiently communicate information about the event to individuals interested in participating. Since the main framework of this site (like many sites) is recycled from page to page, we chose to use a technology which would allow us only to change the central content elements. Rather than using something like an iFrame, which can cause usability concerns, we opted to use the open-source jQuery BBQ library to efficiently get the content of the site to the user without having to reload static elements on every page. jQuery BBQ initially loads only the requested page, then loads only the differing content of each other page and caches the result. So once a user has visited a page, the content of that page will be saved so that future visits don’t require a separate page-load. We feel that we were able to accomplish this and quickly develop a site which satisfied all involved parties.